Several years later when my paternal grandmother started her slow decline in health we took her to Babyland General to adopt a baby. She loved dolls so we knew she would love to have a Cabbage Patch Doll. My mom had made arrangements with the nurses to let my grandmother name the next baby that was born from the cabbage patch. (Oh yes, there are nurses and they take this whole adoption process VERY seriously). A baby girl is born from the patch and they asked who would like to name her. 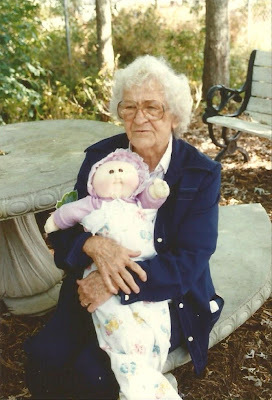 With some nudging my grandmother spoke up and said she wanted to name the doll Jenny. I got to choose the middle name and I went with my grandmother's first name, Pearl. After my grandmother's passing I received three items that belonged to her: her Bible, her ceramic Christmas tree and Jenny Pearl. My Maw-maw with Jenny Pearl on adoption day. My guess is this is the Fall of 1989. 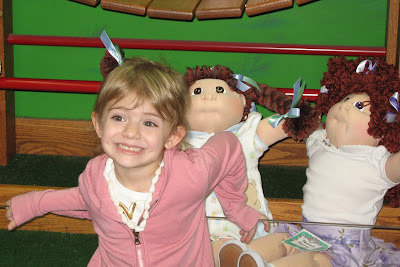 When each of the girls turned 3 my dad took them to Babyland General so they could adopt their own Cabbage Patch Doll. 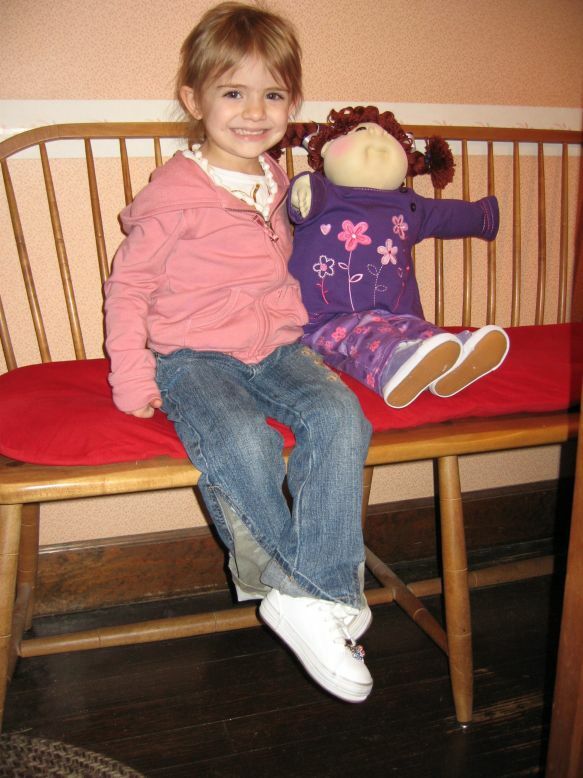 The price tag on these dolls make American Girl dolls look like a bargain so better "Pop" do the buying than us! 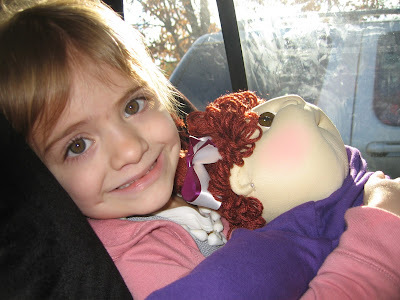 Sydney named her doll Cece Honey after her grandmother's and Jordyn named her doll Kendyll Lynn. Typically these dolls sit up high out of the way so they stay pristine along with my doll and my grandmother's doll, but as of late Sydney pulled the dolls off their perches. Sydney sitting in the office ready to adopt her baby. On our way home with Cece Honey Jones. Jordyn sitting in the office getting ready to adopt her baby. New mommy with baby Kendyll Lynn who is almost the same size a her. At first I didn't want the girls to play with the dolls, but then I was figured why have these beautiful dolls if you can't play with them. After a day of play Sydney started asking me if I could take them to the store to buy their dolls new clothes. Today I finally caved and took them to the thrift store to pick out some clothes for their dolls. $10.00 later we came home with 4 new outfits, a pair of shoes and two happy girls. They have been dressing their dolls in different outfits all afternoon. They were trying to coordinate pants to go with the shirt Jordyn found. I loved their team work! Waiting to pay for their new doll wardrobe. Sydney is holding Jenny Pearl and Cece Honey. Jordyn is holding Stephanie and Kendyll Lynn. I love this story. 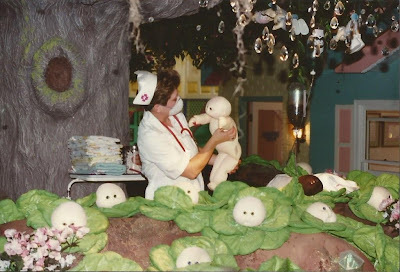 I too remember going to babyland general and looking at all the cabbage patch dolls. Such good times!